Hello everybody! 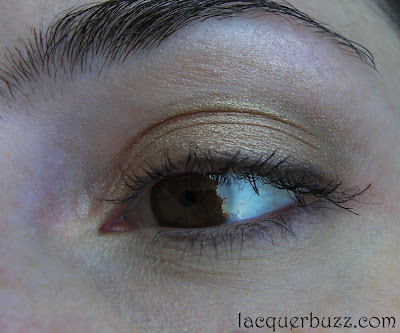 Today's post is a little out of the ordinary because I will be talking about makeup. I don't do a lot of these posts and when I do I always tell you to take it easy on me because I'm by no means a makeup blogger. I did my best to photograph, swatch and do a review for you guys. Please be gentle! Here's what I'm gonna show you today. 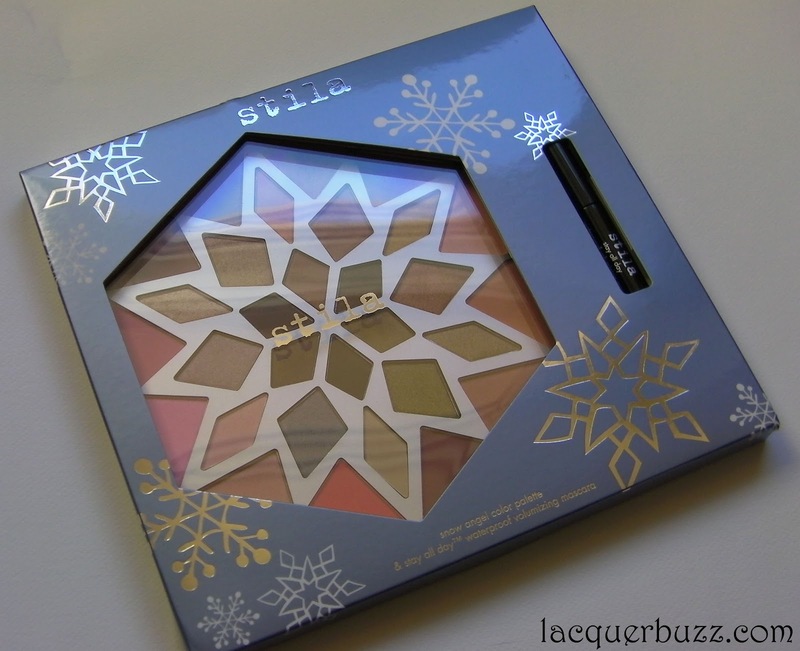 This is a limited edition makeup palette that Stila came out with this winter. I got it from Beauty Bay and was actually hoping for it to show up before Christmas. But the post was slow and so I only received it last week. However, I wanted to show it to you because this is still available on a few websites and it's also on sale. Asos also has it and it's on sale there as well. I chose this over the Urban Decay Naked and a few other smaller palettes because it has a lot more shades, plus cheek colors and it was also cheaper than the UD. What you see above is the palette and the little booklet it comes with. The booklet contains a few looks that you can do using these shades. 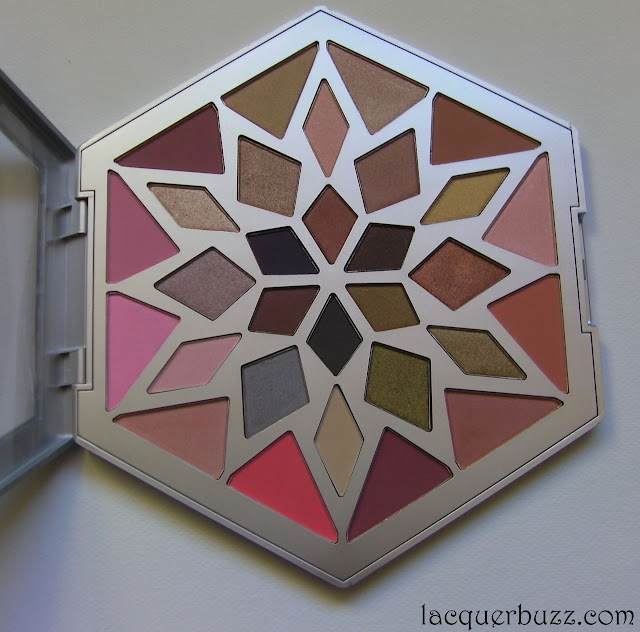 The actual palette is shaped like a hexagon and the colors form the shape of a snowflake. 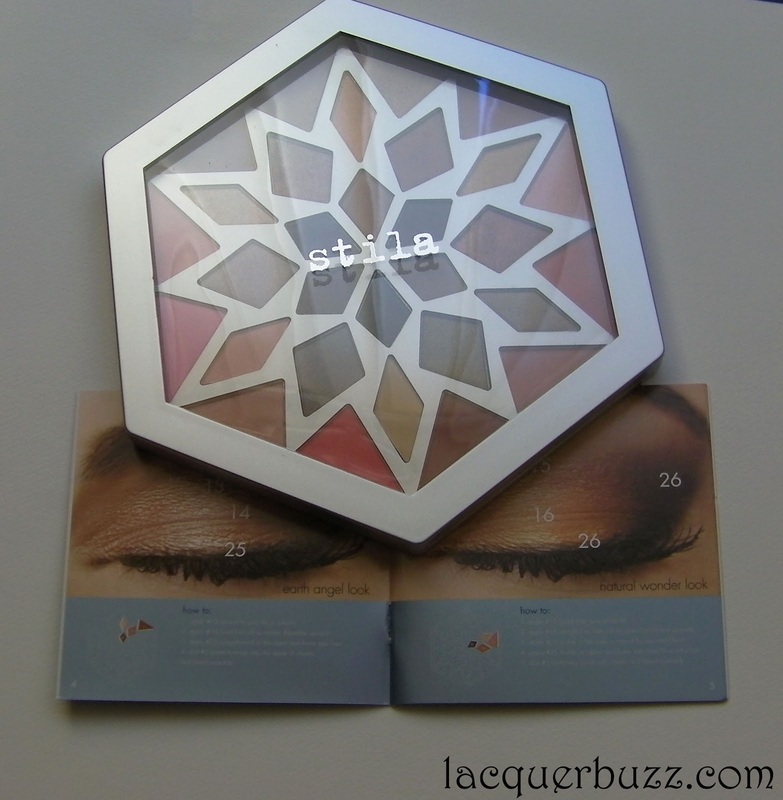 It contains 18 eye shadows (for a total of 0.64oz./18.2g) and 12 cheek colors (for a total of 0.67oz./19g). There's also a travel size mascara included, but I will talk about it at the end. To see swatches my review of this product, keep reading after the jump. The back of the box has a little map of the shades and the name list. They all have proper names and I think at least some of these are available as individual shadows (the famous Kitten comes to mind). A lot of the names are winter themed, so I'm thinking these might have been in previous holiday palettes as well. 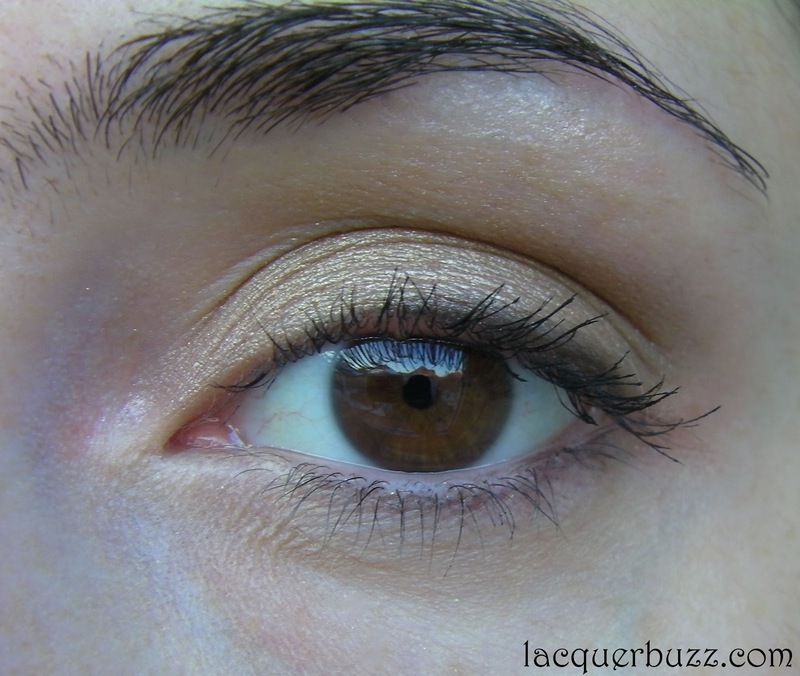 The outer circle contains the cheek colors and the two inner circles contain eye shadows. The palette has the size of a hand and is pretty easy to handle. The packaging is sturdy but there is no mirror, which would come in handy in such a product. Another thing I've noticed is that the lid doesn't open all the way, but stays at a 90 degree angle which could be disturbing. Here's how the colors look in the pan. I'm gonna talk about the cheek colors first. There are 12 cheek colors in this, half being matte and half shimmery. The matte ones are very soft and creamy, with great pigmentation and quality. One of them is a bronzer (called Matte Bronze) that is quite dark for my skin tone, but can be used for contouring if applied with a light hand. The shimmery blushes vary in quality. There are some that are great and then there are some that are a bit chunky and hard in the pan, giving them a smaller color payoff. Overall I really like these blushes. There's a good variety of colors and finishes, the quality is good in almost all of them and they have a decent size. The only thing I don't like is that some of them are not great. Here are the swatches in clockwise order. Now let's talk about the eye shadows. There seem to be 3 categories of shades in this palette. First, there are a few very shimmery ones that contain larger, chunkier shimmer. They might be pigmented but the large shimmer pieces don't adhere to the brush or to the skin. Primer seems to help a bit with this, but not a lot. Shadows in this category include Cookie, Dashing, Merry and Peace. I tend to gravitate to shimmery shades like this, so these were the first ones I tried. Needless to say that I was very disappointed. However, these are just a few compared to the rest of the shadows, which are great. The second category are the ones that contain a finer shimmer. Here we have for example Icicle (amazing silver with a blue sheen), Kitten (golden vanilla) or Sleigh (warm copper). They are beautiful and creamy and just a dream to apply. Finally we have the mattes. There are a few of these and most of them are on the darker side (in the inner circle of the palette). It seems that Stila knows how to do their mattes because these are just spectacular. They are so soft and creamy and mostly with good pigmentation. The only one that is not that pigmented is Fairy, a beautiful matte purple that is great nonetheless. 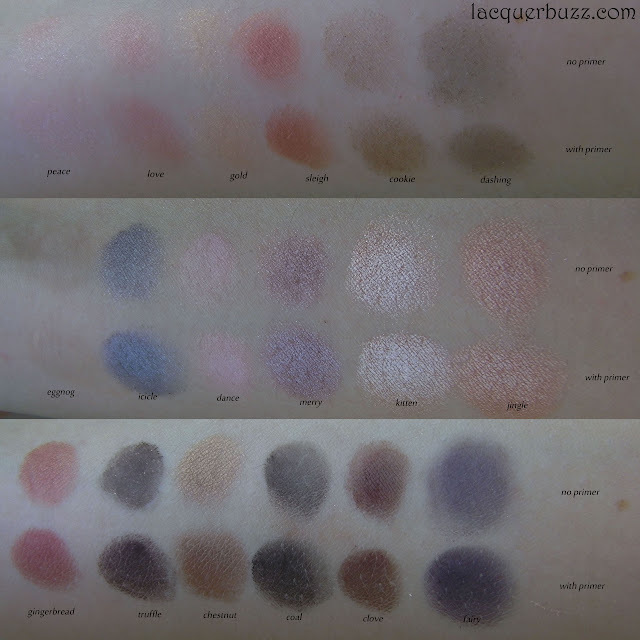 Here are the swatched in clockwise order, first the outer and then the inner circle from the pan. I used the MUA Pro eye primer for the swatches below. Now let's talk about the mascara. There is a travel or sample size (0.10 fl.oz./3.1 ml) Stay All Day Waterproof Volumizing Mascara included with this palette. Now I don't really know what the deal was with this, but the brush was bent on mine. I googled it and this doesn't seem to be a feature of the mascara. My guess is that it probably shouldn't have been like that. 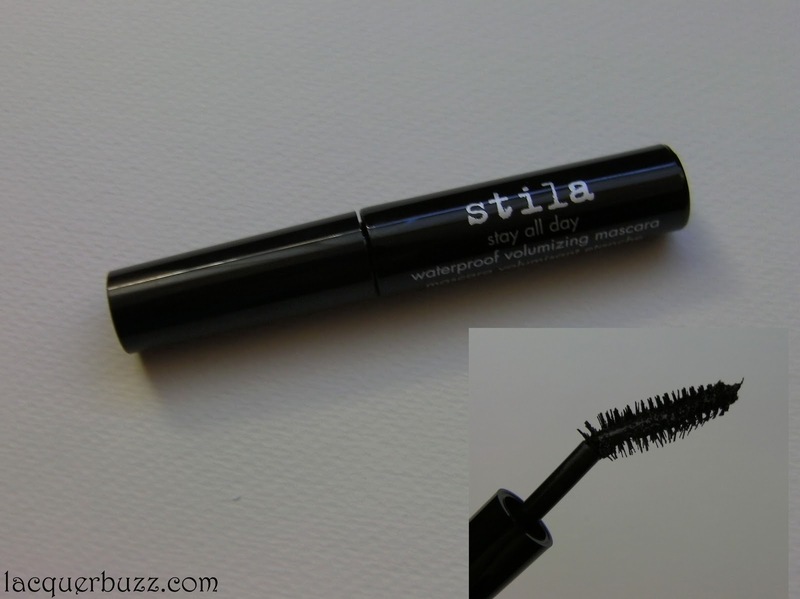 Other than that, I do like this mascara because it does make my lashes look longer and thicker. I have quite dark lashes so I want my mascara to make them really dramatic. This is definitely good for that. Here's how my eye looks with this mascara on. For this look I used some of the shades from the palette (Cookie on the lid, Merry in the crease and Kitten as a highlight) and I also lined my eye with Coal. I did my best to photograph it but I'm just bad at showing eye looks. All the colors look the same, but I assure you they are not. All in all, I'm glad I got this palette but can't say that it has become my new favorite. I would probably use it more if there wasn't another one that I recently got. I will show you that one in a few days too. If you want this one you should hurry and get it because it might not be available for a very long time! Am fost atat de tentata sa o cumpar de sarbatori, dar m-am abtinut, m-am rasfatat cu niste oje. E foarte frumoasa paletuta! Sa o folosesti cu placere! Eu nu-s inca sigura daca sa regret ca am luat-o sau nu. O mai incerc si ma hotarasc :) Multumesc!